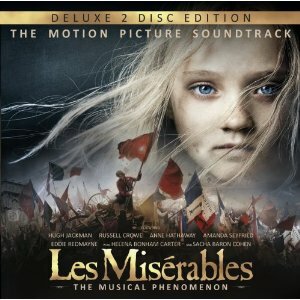 A two-disc edition of the soundtrack to the film version of Les Miserables will be released next month. It will have 22 more tracks than the highlights edition which is currently available. The full soundtrack will be released by Polydor Records on 18th March. You can pre-order it here from Amazon for £14.76. The Highlights edition is currently top of the UK album chart and is the fastest-selling album in the UK this year. Producer Sir Cameron Mackintosh said: "Post-production on the Les Miserables film was extremely tight, with recording of the orchestra, final edit and sound mix having to be completed in only a few weeks. There was only enough time to remix a limited number of tracks so that at least a highlights album could be released for the fans before Christmas. We are delighted with the success of that album and very pleased that we can now add 22 more tracks and audiences can now enjoy at home a full representation of the film's powerful and emotional version of this great score". The new CD packaging will also feature previously unseen photos from the film set as well as additional notes.